The story itself was sketchy on details of the exchange. “Russian President Vladimir Putin came to Baku to participate in the Russian-Azerbaijani interregional forum. Putin will also attend the final stage of the World Judo Championship. 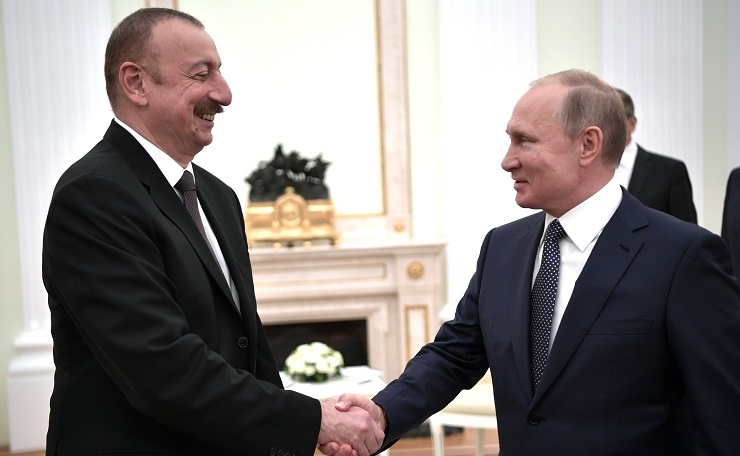 However, behind closed doors, Putin and his Azerbaijani counterpart Ilham Aliyev also discussed topics of military-technical cooperation, the CSTO, as well as issues of the settlement of the Nagorno Karabakh conflict. The Kremlin watched closely the recent visit of Israeli Defense Minister Avigdor Lieberman to Azerbaijan. Lieberman promised to supply state-of-the-art air defense systems to Azerbaijan to build an echeloned defense system on the border with Armenia. In addition, Azerbaijan will continue purchasing unmanned aerial vehicles from Israel, after they proved to be highly effective in the course of hostilities in the zone of the Armenian-Azerbaijani conflict in April 2016. In the aftermath of the September 2018 downing of a Russian IL 20 aircraft and Israel’s continued belligerence and denials of responsibility, it was clear Vladimir Putin would have to act assertively. The incident became even more serious when Israel’s Haaretz newspaper broke a story that claimed high level Israeli military officers had seen Russia’s fairness toward Israel and her position on Hezbollah and Iran inside Syria as a “sign of weakness” leading to aggressive action toward Moscow. This may well have been the straw that broke the camel’s back. As a matter of fact, in its 200 plus air missions inside Syria during 2018, Israel has misused its agreement with Russia, time and time again, to attack Syrian Arab Army positions in order to support ISIS attacks or to allow ISIS leaders to escape from “pincer” moves by Syria’s military. “Reuters confirmed through two Azeri officers that Israeli forces were in place in Azerbaijan and that the president was weighing options of supporting their attack. Yet despite official denials by Azerbaijan and Israel, two Azeri former military officers with links to serving personnel and two Russian intelligence sources all told Reuters that Azerbaijan and Israel have been looking at how Azeri bases and intelligence could serve in a possible strike on Iran. “Baku (Reuters) – Israel’s “Go-it-alone” option to attack Iran’s nuclear sites has set the Middle East on edge and unsettled its main ally at the height of a US Presidential Election Campaign. Prime Minister Benjamin Netanyahu exudes impatience, saying Tehran is barely a year from a “Red Line” for atomic capacity. Many fellow Israelis, however, fear a unilateral strike, lacking US forces, would fail against such a large and distant enemy. But what if, even without Washington, Israel was not alone? “Azerbaijan has been following a policy of non-interference in the (internal) affairs of other countries,” Baku’s ambassador to Pakistan Dashgin Shikrov said in an exclusive interview with the Pakistani Daily, The Newson Monday. The ambassador strongly rejected rumors in the Western media outlets about his country’s readiness for providing Israel ground facilities for attacking Iran’s nuclear sites. “Azerbaijan is a member of the Organization of Islamic Cooperation (OIC) and nobody should have any doubt that it will not permit the use of its territory for committing acts of aggression against another OIC member,” the ambassador added. “An Israeli spy drone which Iran recently downed on its way to one of the Iranian nuclear sites had taken off from an air base in Azerbaijan’s Nakhchivan Autonomous Republic, Press TV reported, citing unnamed sources. The sources said the Hermes drone, which was taken down by Iran’s Islamic Revolution Guards Corps (IRGC) forces on August 23 after 300 kilometers of flight, was bound for the Natanz enrichment facility in central Iran. Iran’s nuclear facilities have been a regular target for espionage activities by US and Israeli secret services, which have at times used drones for this purpose. However, all efforts made to this end have been successfully thwarted by the Iranian military forces. It could very well be that the executives made this decision consciously since Orbiter 1K has a so-called man-in-the-loop guidance system whereby the operator is either actively flying or otherwise monitoring the video feeds from the drone and they can see what it sees throughout the mission. However, in 2010, Israel began transiting munitions from the Black Sea port of Poti in the Republic of Georgia to Azerbaijan, brought in by the controversial visit of the USS Grapple accompanied by Israeli patrol craft. Reports from sources on the ground in Georgia, confirmed by Jeffrey Silverman of Veterans Today in Tbilisi, tell of a convoy of heavy munitions transiting ground routes toward Azerbaijan, guarded by Israeli security and American private military contractors working for Bechtel Corporation and British Petroleum. What has become clear is that Russia is beginning to recognize Israeli actions on her border as a deeper threat than previously noted. Exacerbating the issue is the Trump administration’s willingness to back any Israeli military moves, something President Obama totally refused. Adding Trump to the mix has empowered extremists within the Israeli military, if the Israeli press is to be believed, taking a clear side against Russia believing that American military power can mitigate any potential downside for Israel. If Israel’s assessment of President Putin as “weak and indecisive” turns out wrong, as most analysts know quite well, events are likely to turn against Israel.